In a significant vineyard expansion, Okanagan Crush Pad Winery Ltd. has purchased 317 acres of ranch land in Summerland’s Garnet Valley with about 85 plantable acres. “We are getting ready to plant this coming spring,” says Christine Coletta, one of the majority owners of OCP with builder Steve Lornie, her husband. The fast-growing OCP winery, which will do just its second crush this fall, is based on the 10-acre Switchback Vineyard. The plans for the Garnet Valley vineyard are being developed by OCP in conjunction with OCP’s Italian winemaking consultant, Alberto Antonini and a Chilean “wine terroir” consultant, Pedro Parra. The varieties under consideration include Pinot Gris, Pinot Noir and Cabernet Franc. Christine and Steve have emerged rapidly as major players in Okanagan wine growing since 2005 when, on a whim, they bought an orchard that became the Switchback Vineyard and was planted entirely to Pinot Gris. Christine, of course, has been a force in British Columbia wine marketing since 1992, when she was named executive director of the British Columbia Wine Institute. She spent almost a decade building the market for Vintners’ Quality Alliance-branded wines. She left BCWI to set up her own firm, Coletta Consultants Ltd., providing branding, packaging and marketing services for a number of wine industry clients. "My attitude is blaze ahead, boldly go forward and do, do, do,” she once told me in an interview that captured her hard-charging style. The dramatic growth of OCP is an example. The Switchback Vineyard was just coming into coming into production in 2009 when Michael Bartier, now OCP’s head winemaker, persuaded Steve and Christine to launch their own wine rather than sell grapes. They let Michael make 160 cases of wine that fall, testing the market with the wine under the Haywire brand. With classic Coletta brio, they made 4,500 cases of wine in 2010, just their second year. Then Steve, with a long and successful career in construction, built the 8,000-square foot OCP winery in 2011, just in time for it to produce 7,500 cases last fall for Haywire and other OCP brands. Crush plans for 2012 call for producing 10,000 cases for the OCP brands. That production, along with making wine for clients of OCP, is quickly taking the winery to its design capacity of 30,000 cases a year. Building a winery capable of handling custom crushing is critical to OCP’s business strategy. “It enables us to buy the equipment we want to buy and to ensure that everything we have is top notch,” Christine says. Many of the clients also use the full suite of marketing services through OCP, providing additional revenue streams to the business. Together with their consultants, Steve and Christine spent two years looking for property before settling on Garnet Valley, a bucolically attractive valley northwest of Summerland. Currently, the only grapes grown here are believed to be those in a small vineyard planted, beginning in 2003, by George Lerchs. A retired civil servant, he once considered opening a winery but decided to sell the grapes. The varieties grown here include Pinot Gris, Pinot Noir and Gewürztraminer. OCP purchased a neighbouring parcel that, crucially, has never been either a vineyard or an orchard. “What Pedro was looking for was raw land that had never been bulldozed or disturbed,” Christine says. The winery is readily visible from downtown Osoyoos. It is also on the same street that leads to Nk’Mip Cellars, the first winery in Osoyoos. It is a location that should keep the expansive tasting room busy all season. Operated by two families of Portuguese ancestry, this is the fourth winery in Osoyoos. The other two are Moon Curser Vineyards and Young & Wyse. These comprise the critical mass for a day of wine touring, including a lunch at Nk’Mip and a cultural tour at Nk’Mip’s desert interpretation centre. Here is the profile of Adega on 45th winery from the recent edition of John Schreiner’s Okanagan Wine Tour Guide. Ringing the church bells to communicate deaths and other important village events was an art that Alex Nunes learned one summer in his native Portugal. He was 13 and home from a stint in the seminary. Although he emigrated to Canada two years later, the memory of the two big bells in that village church inspired Alex to add a bell tower to the winery’s façade when it was built in 2011. There is, however, no bell in the tower, at least for now. “It is just for show,” Alex admits. The winery, whose warm butterscotch tones fit the desert landscape of Osoyoos, was designed by Alex and his brother-in-law, Fred Farinha, who own the winery with their wives, Maria and Pamala. The winery sits high on the vineyard’s west-facing slope. The tasting room windows offer a grand view over the town and the lake. The 557-square-metre (6,000-square-foot) winery has thick concrete walls and a naturally-cooled cellar, for 400 barrels, buried against the hillside. The interior’s public areas acquired the instant patina of age by having walls finished with Italian clay and tiles on the floor. The winery’s European ambiance reflects the Portuguese heritage (adega is Portuguese for cellar). Alex was born in Portugal in 1950 while Fred was born in Penticton in 1966. Their families were among the many Portuguese immigrants who came to Osoyoos at that time as tree fruit growers. Both Alex and Fred operated orchards until about 2005 when vanishing returns from tree fruits left them with a stark choice: sell the land or plant grapes. “We decided to keep the land and build a winery,” Alex says. Initially, they were going to sell grapes to existing wineries. After planting three vineyards totalling 15.4 hectares (38 acres), they plunged completely into wine production. “Create our own future, you could call it,” Alex says. Wine, after all, is in their blood. “We had wine on our tables and in our homes, always, since we were born,” Alex remembers. “Your mom would ask to you go to the tavern in the village to get a litre of wine. It did not matter if you were five years old or ten years old. You would just go and get it.” While they use a consulting winemaker, Alex and Fred, with years of experience as home winemakers, do much of the work in the winery as well as the vineyard. They grow all the major varietals found in the south Okanagan. Alex even has two late ripening Touriga Nacional vines even though he doubts the variety, used in port production, will thrive in the Okanagan. Adega will make its port with Merlot. Because the term, port, cannot be used in Canada, the winery will call it Portāo Da Adega – meaning door of the cellar. Here are notes on those wines available for tasting at the time of my visit. Felicidade 2010 ($16). Named for one of the family grandmothers, this is a Viognier. The wine is crisp, with flavours of melon and pineapple and a spine of minerality. 87. Viognier 2010 ($20). Appealing and juicy in texture, this wine has flavours of peaches and apricots. 88. Pinot Gris 2011 ($20). Consulting winemaker Phil Soo has crafted a popular patio sipper, with apple and citrus aromas and with flavours of peaches. 88. Rosé 2011 ($17). This is a somewhat unconventional blend of equal parts Merlot and Viognier that succeeds as good dry rosé for summer. It has aromas and flavours of strawberries and a crisp finish. 88. Syrah 2010 ($N.A.). This begins with the classic black pepper aroma and flavour common with South Okanagan Syrah. On the palate, there are flavours of black cherry, fig and liquorice. The tannins are ripe and approachable. 88. Cabernet Franc 2011 (tank sample). This is a marvellous, full-bodied red with the brambly aromas and flavours that distinguish this varietal in the Okanagan. 90. Manuel 2011 ($N.A.). Another unconventional blend – Merlot, Cabernet Franc and Viognier – this was not yet available when I visited. The name honours a family grandfather. Symphony Vineyard, which opened early in June, has returned winegrowing to a Saanich farm that grew loganberries in the 1960s for Growers Wine Company, then based in Victoria. Lamont Brooks, who runs this winery with his wife, Pat George, is a second generation member of the Brooks family to manage this farm, once 30 acres in size and now 10 acres. His mother, Thelma, also grew strawberries before Lamont and Pat leased part of it for the 2.1 acre vineyard they planted in 2004. The winery represents a second career and a lifestyle choice for the couple, both of which are trained in geology and earth sciences. Lamont, who was born 1957, is a physics graduate from the University of Victoria. Upon graduation, he went to work in the oil industry in Calgary, where he met Pat. They spent 13 years with Shell, including three years in Holland, until Vancouver Island drew them back in 2003. Pat now describes herself as fully retired from the oil industry while Lamont remains modestly involved with a start-up oil and gas company. They returned to the Saanich Peninsula at a time when the promoters of Victoria Estate Winery had been encouraging the planting of small vineyards. From the start, this was much more than a hobby. They joined the Wine Islands Growers Association, with Pat serving for many years as the president. WIGA is a technical association that promotes education and problem solving for the grape growers and winemakers of the coast. It is vital because most of the viticultural research is done in warmer terroirs, like the Okanagan and California, and is of limited use on the coast. The varietals planted for Symphony are Pinot Gris, Gewürztraminer, Pinot Noir and Léon Millot. The latter is a French hybrid from Alsace plant breeder Eugene Kuhlmann, who also developed Maréchal Foch. Lamont and Pat planted it to produce a full-bodied red. In a typical year, the vineyard should yield enough grapes for about 400 cases (the winery opened with about 300 cases from 2011, a difficult, low-production year). Lamont and Pat will augment that by buying grapes from other island growers as they target an annual production of 600 cases. They do not plan to buy Okanagan grapes. “We do want to stay with island fruit,” Pat says. They have already noted the positive response when consumers in the wine shop ask where the grapes come from -- and they can point the vineyard that is just a few hundred yards away. The view from the wine shop also takes in a picnic patio, the locale of some of the music events held here over the summer. Given the winery’s name, it is only logical that they would host musicians. The first wines released this summer establish Symphony as a winery worth visiting. Here are my notes. Symphony Pinot Gris 2011 ($18). This wine begins with an appealing and fresh aroma of lime and rhubarb which carry through to the flavour that also has hints of pear. The finish is tangy and crisp. 89. Symphony Pinot Gris 2011 (barrel-fermented) ($19). Barrel fermentation has given the wine a fuller palate. It still shows attractive aromas and flavours of citrus and has softer acidity while still having a dry finish. 90. Symphony Gewürztraminer 2011 ($19). Nicely balanced to finish dry but not austere, this wine has delicate citrus aromas and flavours with the classic hint of lychee that the variety often shows. 90. Symphony Pinot Noir Rosé 2011 ($18). This wine displays a lovely rose petal hue, with aromas and flavours of strawberries. It has a dry finish but with just a trace of residual sugar to give it a juicy texture. 90. Symphony Millot 2011 ($21). Aged in American oak, this is a dark and fleshy wine, with aromas of black cherries and flavours of plums and cherries. The soft tannins – a touch of tannin was added during fermentation – give the wine youthful approachability. 89. 6409B Oldfield Rd, Saanichton, BC V8M 1X8. Here, I am relying on the broad shoulders of Tinhorn Creek Vineyards to carry an accumulation of reviews – not just of Tinhorn but of some of its peers. The big news from Tinhorn Creek is the release of the winery’s first reserve Pinot Noir, its 2008 Oldfield Series Pinot Noir. This variety is virtually every winemaker’s Holy Grail. When a winery gets it right, it means that this finicky variety was well grown and that the winemakers did not screw it up. Tinhorn Creek got it right. The other detail to note is the age of both of its Pinot Noirs. The reserve is almost four years old and the regular is almost three years old. After working on its release cycle for several years, the winery is able to give its reds more time to develop in bottle before release. Thus, the wines are more ready for consumption when you buy them. In theory, that should increase the price of the wines. Somebody should be paying for the storage. But Tinhorn Creek is pricing its wines very fairly. The winery reviews are alphabetical here. It has been a busy summer at Black Hills, with the opening of a $1 million tasting room and, now, the release of a second label, called Cellarhand. At least, that is how the winery spells it in a media release. On the bottles, the label is two words, both lowercase. The logic behind a second label is simple. Any winery that wants to elevate its first labels – and Black Hills certainly is trying to raise the bar with Nota Bene, its premium red blend – will have some wine that does not make the cut for the blend. This certainly still is good wine, just not up to bottling in wines selling at more than $50 each. A winery without a second label usually sells the cull wine. There are not many Okanagan wineries that would turn down the culls from Black Hills, knowing the quality is there easily for blends fetching $20 to $25. Well, Black Hills decided to bottle the culls for its own second label. The result: very good wines at reasonable prices. The current releases from Black Hills include both its flagship wines and the new second label wines. Black Hills Carmenère 2010 ($50 for a production of 300 cases). This is an interesting and complex red with aromas of pepper and red berries. The pepper carries through to the palate, along with flavours of plum, black cherry and chocolate. The alcohol is a moderate 12.2%, as it was in 2009, a much warmer vintage. This seems to be a variety that develops flavour before packing on the sugar. 90. Black Hills Alibi 2011 ($24.90). This is a blend of 75% Sauvignon Blanc and 25% Sémillon. The Sémillon was barrel-fermented in oak puncheons. The wine begins with aromas of herbs, grapefruit and lime, leading to flavours of grapefruit, kiwi and peach. The Sémillon contributes to the full texture and the subtle notes of honey. 90. Cellar hand Punch Down Red 2010 ($24.90). This is a blend of 45% Syrah, 27% Cabernet Sauvignon and 28% Merlot. This is a delicious and accessible red, with aromas of plum, black cherry and pepper. On the palate, there are flavours of peppery black cherry along with the gamy fruit of the Syrah. The texture is generous. 89. Cellar hand Free Run White 2011 ($15.90). This is amazing value. The wine is a blend of Pinot Blanc, Pinot Gris, Viognier, Chardonnay, Sémillon and Sauvignon Blanc. The percentages are not disclosed, not that that matters to most consumers. The wine is a fruit salad of aromas and flavours: ripe peaches, apricots, melons and a touch of apple. It has a fine spine of minerals and tannin (the Viognier kicking in?) that gives the wine a crisp focus; yet the texture is rich and lingering. 90. Clos du Soleil Winery is a four-year-old producer which sells its wines through its website, and private wine stores and now from its wine shop on Upper Bench Road near Keremeos. The partnership which operates this winery, headed by a former Canadian naval officer named Spencer Massey, draws its wine styling inspiration from France. The wines are made by Ann Sperling, a member of a pioneering Kelowna grape growing family. A winemaker now with 28 years experience, she works in Ontario as well as in the Okanagan. Her hand shows in the polished wines that Clos du Soleil is releasing. Clos du Soleil Fumé Blanc 2011 ($19.90 for 450 cases). A portion of this wine, which is 98% Sauvignon Blanc and 2% Sémillon, was fermented in new 500 litre French Oak puncheons. The oak is suitably subtle, allowing the fruit aromas and flavours to keep the centre of the stage. The aromas includes herbs, lemon and lime. There is a lovely note of lime on the textured palate, with a crisp, dry finish. 91. Clos du Soleil Célestiale 2010 ($24.90 for 250 cases). One of several Bordeaux blends from this boutique producer, this is 52% Cabernet Sauvignon, 39% Merlot, 9% Petit Verdot. The wine begins with aromas of red fruit and vanilla. On the generous palate, there are flavours of cherries, plum, chocolate and tobacco, with long ripe tannins. 90. Laughing Stock Vineyards has emerged as one of the star producers on the Naramata Bench since David and Cynthia Enns opened it in 2005. This summer, the winery made Profit magazine’s annual list as one of the 200 fastest growing companies in Canada – the only winery on that list. According to the magazine, the winery – which produced 6,000 cases in the 2011 vintage – has had a five year revenue growth of 279%. That reflects both the effective way in which the wines are marketed and the quality of the wines. Among Laughing Stock’s niches: Portfolio, its flagship Bordeaux blend, has become a leading gift wine among corporations. And Portfolio and its little brother, Blind Trust Red, were among the top sellers last year among B.C.’s Meritage style wines. Portfolio is not among the releases that the winery sent me earlier this spring. Blind Trust Red 2010 ($29.10) was but the bottle was corked; hence, no review. However, Laughing Stock has such a track record that I never hesitate in buying the wines even without having tasted them. A note for wine tourists: Laughing Stock has reverted to opening its wine shop by appointment only this year. With only a six-car parking lot, it had to do something to control the traffic that overwhelmed the winery last year. Here are notes on those I did taste. Laughing Stock Pinot Gris 2011 ($22.10). This appealing wine begins with aromas of pear and citrus, leading to flavours of pear and peach in a juicy fruit cup of a wine. 90. Laughing Stock Blind Trust White 2011 ($25.10). When you unwrap the capsule, you find that this is a blend of 43% Pinot Gris, 29% Pinot Blanc and 28% Viognier. The blend varies from year to year – you need to trust winemaker David Enns to come up with an interesting blend. 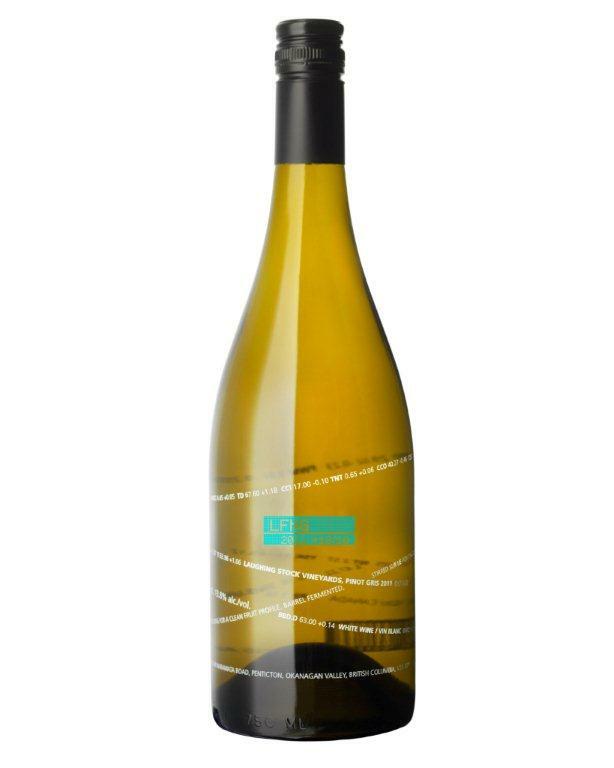 This is a crisp and dry white with flavours of apples, melon and citrus, with a spine of minerals and with the full texture that suggests lees stirring was involved. 88. Laughing Stock Viognier 2011 ($26.10). The wine begins with tropical fruit aromas of apricot, peach and guava. It delivers a rich bowl of fruit, including flavours of pineapple, papaya and apricot. The fruitiness fools the palate with luscious sweetness. The finish is dry and refreshing. 90. Laughing Stock In The Pink Rosé 2011 ($22.10). Every $2 from a sales of this wine goes to the Canadian Breast Cancer Foundation. Salmon pink in colour, the wine has aromas of strawberry, plum jam and, surprisingly, chocolate. There are flavours of crabapple, plum and cherry. The wine has a crisp and almost austerely dry finish. 89. Laughing Stock Syrah 2010 ($34.10). This wine, only the third Syrah release from the winery, won a Lieutenant Governor’s Award of Excellence this year. In fact, Laughing Stock is a repeat winner of this award; last year, it won with a Pinot Gris. This wine is made in the classic Côte Rotie style, blending 94% Syrah with 6% Viognier. The grapes are grown near Osoyoos, superb Syrah terroir. The wine has white pepper on the nose, with a touch of that on the palate. Big and generous, the wine tastes of plum and black cherry. 90. SpierHead Winery is a two-year-old winery in East Kelowna, located in former apple orchard. A number of the trees have been retained, bordering the charming driveway that leads to this winery. The estate vineyard is called the Gentlemen Farmer Vineyard, reflecting that the partners here – a professional photographer, a lawyer and a broker (and their wives) – might be considered gentlemen farmers. The Riesling is the second vintage from the property while the Pinot Noir is the first vintage. “Recognizing that the Pinot Noir is a juvenile wine, we are not trying to overreach with pricing,” says Bill Knutson, one of the owners, explaining why it has been released at $17.90. Well, I think he is underselling the wine. You should snap up this wine because, at that price, it is a great bargain. Look for it in VQA and other private wine stores if you don’t get to the winery. The latest news from this winery is that it has just hired Bill Pierson as its winemaker. Bill most recently was the winemaker at Fort Berens and, before that, assistant winemaker at CedarCreek. SpierHead Riesling 2011 ($21.90 for 185 cases). This wine begins with aromas of citrus and herbs. On the palate, there are bright lemon flavours with a refreshing, tangy acidity. Even though the wine has almost 12 grams of residual sugar, the balance gives it a finish that is crisp and seems dry. 89. SpierHead Pinot Noir 2010 ($17.90 for 534 cases). Dark in colour, this wine is made with three Pinot Noir clones. It spent 11 months in French oak. The aromas include hints of the oak, along with spicy cherry. On the palate, there are cherry and strawberry flavours, with a texture that is evolving toward the silkiness of the varietal. This wine has 12.1% alcohol, accounting for its lively feminine style. 90. Tinhorn Creek Chardonnay 2011 ($17.99). This is a light, fruit-forward Chardonnay; only 15% went into new French oak. The aroma has a hint of orange, leading to apple and citrus flavours and a spicy, dry finish. 88. Tinhorn Creek Pinot Noir 2009 ($19.99). This fleshy wine, with 14.7% alcohol, reflects the big ripe vintage that 2009 was. There are aromas of spice, herbs and cherries, with flavours of strawberries and cherries. 89. Tinhorn Creek Oldfield Series Pinot Noir 2008 ($29.99 for 250 cases). Three years of bottle aging have enabled this wine to develop an elegantly silky texture. The aroma opens with spice and raspberry. On the palate there are concentrated flavours of cherry and raspberry, with a hint of mocha on the finish. 90. Tinhorn Creek Cabernet Franc 2010 ($19.99 for 2,882 cases). This wine explodes with vibrant, juicy red fruit – raspberry, blackberry – with a note of vanilla and cedar on the finish and with a tannin structure suggesting this will develop well in the cellar. The screw cap is doing its job in keep the fruit lively and fresh. 89. Tinhorn Creek Oldfield Series Kerner Icewine 2011 ($29.90 for 200 ml). This wine begins with rich aromas of honey, baked apples and apricot. Superbly balanced, it is not at all cloying. Rather, the flavours of apple pie with cinnamon and caramel are delicious and linger cleanly on the long finish. 92. One of Sonoma’s most historic producers, Valley of the Moon Winery, has been purchased by the partnership that includes the owners of Quails’ Gate Estate Winery in the Okanagan. Valley of the Moon, whose history dates from 1863, is a 45,000-case producer that been operated since 1997 by Heck Estates, the owner of sparkling wine producer F. Korbel and Bros. Heck has recently been trying to sell some winery assets to concentrate on its sparkling wine and brandy business. The new owner of Valley of the Moon is West Coast Wine Partners LLC, a company set up two years by the Tony Stewart, president of Quails’ Gate, and by Dan Zepponi, a Californian who formerly was president of Mission Hill Family Estate Winery. The partnership is a vehicle to produce California wines. Last year, it launched a Napa Valley Cabernet Sauvignon under the label, Plume Winery. With Quails’ Gate an established winery producing about 50,000 cases, Stewart began looking for a winery investment outside Canada several years ago, even as far away as Australia. Zepponi persuaded him to invest in California, which is closer and which has a better domestic wine market. In a 2010 interview with The Globe & Mail newspaper, Stewart explained the rationale for this investment. “It is strategic because Quails’ Gate has got to a certain size,” he said. “Having a U.S. operation of a similar size means there can be synergies in viticulture; and oenology team members can move back and forth. It provides the opportunity to gain access to the U.S. market. And we’re a partner in a wine distribution agency for Western Canada” which would get California wines for its portfolio. Stewart and Zepponi know each other because Zepponi spent two years (2007 to 2009) as president of Mission Hill and its holding company, Artisan Wine Company. Zepponi’s family arrived from Italy to grow grapes in California about the same time that Stewart’s grandfather emigrated from Scotland to the Okanagan. Zepponi’s father partnered with the deLeuze family to operate ZD Winery. 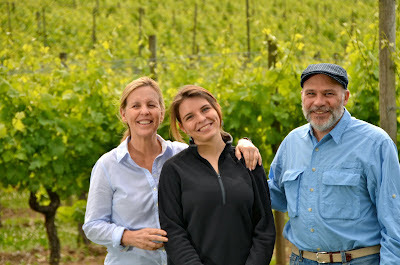 Ultimately, the Zepponi family sold its interest in the winery but Dan and his siblings have continued in wine careers. Prior to coming to Mission Hill, Dan had been the senior vice-president for production at Beringer Estates. The first vintage of Plume, a 2009 Cabernet, was made under a custom crush arrangement. Last year, Zepponi and Stewart said they were looking for a Napa winery or a property for a standalone winery. It appears that the decision of Korbel owner Gary Heck to shed some assets provided Zepponi and Stewart with the opportunity to pick up a venerable producer. Heck has updated the winery substantially while retaining its historic ambiance. Heck also owns nearby Kenwood Winery; a deal to sell that to Banfi Vintners recently fell through. “Situated in the Sonoma Valley on land first planted to grapes in 1863, Valley of the Moon Winery is housed in a beautifully restored stone and redwood winery built in 1887. Blessed with rich volcanic soils and a distinctive "banana belt" microclimate, the estate vineyard has been a revered source of grapes for well over a century. A block of "old vine" Zinfandel planted in the 1940s is complemented by more recent plantings of Barbera, Sangiovese and Petite Sirah, all farmed sustainably with natural soil amendments and natural pest controls. The land on which the Valley of the Moon Winery and Vineyards is located has an illustrious past. Once, it was part of the vast 48,000-acre Agua Caliente Land Grant owned by General Mariano Vallejo. Subsequently it changed owners several times until 1863 when the "Stone Tract" portion of the property was conveyed to Mr. George Whitman. According to the best records, Mr. Whitman was the first owner to grow wine grapes on the land. He built a winery and by 1876 his enterprise was a successful one, annually producing 50,000 gallons of wine and 2,000 gallons of brandy. In 1881, Whitman granted a portion of his property to the Sonoma & Santa Rosa Railroad Company. A passenger train station was built and tracks from Sonoma to Glen Ellen were laid down. Two years later, Whitman sold the property to Mr. Eli T. Sheppard, former consul to China, and later an advisor in international law to the emperor of Japan. Sheppard named the property "Madrone Vineyards" and in 1887 began constructing the first of two stone wine cellars on it. Due to poor health, Sheppard retired to San Francisco the following year, and sold the vineyards and winery to Senator George Hearst, father of newspaper magnate William Randolph Hearst. Senator Hearst lived on the property, further developing Madrone Vineyards into a serious winemaking operation. He proudly served his wine to guests in Washington, D.C. In 1891 Hearst died, leaving the property to his widow. In 1905, the property passed to the Union Trust Company of San Francisco. Between 1911 and 1922, it was owned by two large wine companies - Great Western Vineyards, and the California Wine Association. In 1922, during Prohibition, the property was acquired by Mr. Louis Engelberg. As the story goes, he did not make wine, but he did take good care of the vineyards and sold his grapes to other wineries. Financial difficulties evidently forced Engelberg to take out a loan from the California Pacific Title and Trust Company; the loan was transferred to the Lincoln National Life Insurance Company, which, sadly, foreclosed on the property in 1938. Until 1941, Madrone Vineyards sat neglected. In January of that year, two San Franciscans, Enrico Parducci and Peter Domenici bought the property, which by this time, extended over approximately 380 acres. From 1941 to 1956, Parducci and Domenici ran the winery and vineyards, renaming it "Valley of the Moon Winery." They sold their wines in the San Francisco area and their grapes to various local wineries including Sebastiani, Round Hill, and the Christian Brothers. The Parducci family continued to run Valley of the Moon Winery from the mid- 1950s until March 1997 when the owners of neighboring Kenwood Vineyards purchased the business and property. Here is a stunner: the Saanich Peninsula’s Starling Lane Winery will close next year. That is not due either to a lack of success or a lack of accolades. Starling Lane, which is virtually sold out for this season except for its blackberry port, has always made some of the best wines in British Columbia. “Next year we will be celebrating our tenth and final year as a winery. This was not an easy decision to make. We have taken great pride in producing high quality wines solely from our local vineyards but our initial "retirement adventure" was to last 5 years. That we are entering our 10th year of successful production speaks well of our partnership, but it is now time to re-evaluate our workload and have more time for life's other offerings. “The most enjoyable part of the venture has been meeting so many wonderful people: our loyal customers and the many visitors to our tasting room, local chefs and restaurant workers, staff at local wine shops, sommeliers and wine enthusiasts, tour group directors, and the many devoted grape growers and vintners in the Island wine industry. We thank you all for the joy you have brought us. “Please note that Heritage Farm, site of Starling Lane Winery, will continue booking weddings, tours and related agri-tourism events. Contact Jackie Wrinch for more information. As understandable as the decision is, it is a big loss for wine lovers. The three partners were exceptional grape growers and John Wrinch brought the precision of a diamond cutter to making the wines. Here is the Starling Lane profile from the 2009 edition of my book, The Wineries of British Columbia. The six partners at Starling Lane initially considered calling it the Hanging Judge Winery because the winery is on a farm once owned by Sir Matthew Baillie Begbie. British Columbia’s first chief justice, he was unfairly dubbed the hanging judge after his death in 1894 even though he did not hand out an unusual number of death sentences for the times, and even commuted some. Starling Lane’s partners decided against using the judge’s nickname, prudently perhaps. “We started thinking that some of the victims may have relatives in the area,” Jerry Mussio quips. The partners were among those pioneering Saanich Peninsula vineyards in the early 1990s. Jerry, an educational consultant, and his California-born wife Sherry bought their farm in 1993 and, in addition to raising sheep, planted a test plot of Ortega. Jerry was born in Trail in 1944, the son of Italian immigrants, and he was a home vintner. Planting vines on the farm’s rugged soil expressed his Italian heritage. Ultimately, the couple expanded to just under a hectare (two acres) of Ortega, Pinot Gris and Maréchal Foch. Sherry, a former teacher, is an artist and the designer of Starling Lane’s folksy but smart labels. The second couple in the partnership are John and Jacqueline Wrinch, whose Heritage Farm is the original Begbie property. John saw the Mussio vineyard while buying one of their lambs and soon began developing a similar-sized planting, with eight varieties dominated by Ortega, Foch and Pinot Noir. 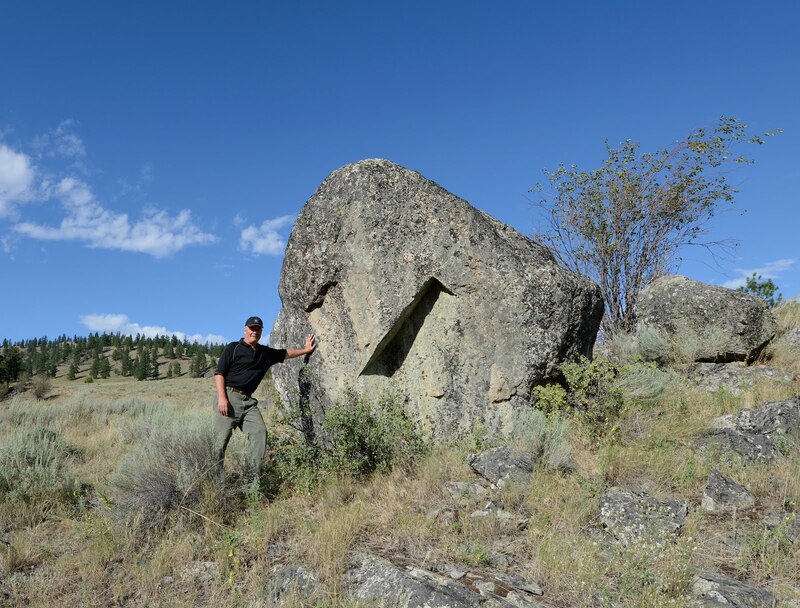 A Victoria radiologist, John had begun making award-winning home wines when he practised in Kamloops. When Starling Lane was born, he was tapped as the winemaker because of his scientific training. Jacqueline, experienced as an event planner (the farm is a favourite wedding venue), became the tasting room manager. The third couple, Sue and Ken Houston, met their partners at early meetings of the island’s grape growers association. They also have just under a hectare of vines at their Hummingbird Vineyard, growing Foch, Pinot Noir, Pinot Gris, Pinot Blanc and Gewürztraminer. They are both Victoria natives and former owners of a heating contracting business. Sue transferred her accounting skills to running the winery’s books while Ken managed the renovations that turned the Heritage Farm barn into an attractive winery. Many of the small vineyards that sprang up in the Saanich Peninsula in the 1990s intended to sell grapes to Victoria Estate Winery which opened in 2002. However, the new winery’s offering prices were less than the growers expected, and then that market evaporated as Victoria Estate slid toward receivership. The Starling Lane partners decided to pool their grapes, their talents and their resources to create a boutique winery making between 6,000 and 8,000 bottles a year from their own vines and from a contracted two-hectare (five-acre) Cowichan Valley vineyard. The winery works because the partners have talents that support each other and a shared passion for growing good grapes. That calls for unusual commitment, given the somewhat marginal growing conditions of the cool and sometimes rainy Saanich Peninsula. The most difficult grape to ripen among the varieties they grow is Pinot Noir (Jerry and Sherry pulled out the few vines they had). Yet, at the Northwest Wine Summit in Oregon, the winery won a gold medal for its 2005 Pinot Noir and a bronze for the 2006 vintage. The secret, they have found, is to carry only a small crop on the Pinot Noir vines so that the grapes ripen well. “And when we pick Pinot Noir, we selectively pick only the best bunches,” Jerry says. “In a poor year like 2007, we pick the Pinot Noir early, combine it with Chardonnay and produce a traditionally-made sparkling wine.” And the winery wins awards with this wine as well. Like the Pinot Noir, all of the wines are hand-crafted, starting with good vineyard management. With limited production and brisk sales, Starling Lane only opens its tasting room on weekends in summer. Even when only one or two wines are available, the winery is worth the visit. The Wrinches have taken pains to retain features at Heritage Farm with a 19th Century feel. The spirit of Judge Baillie remains in residence. In the spring of 2007, Burrowing Owl Vineyards bought an Osoyoos property that it calls Eva’s Vineyard. The vineyard, with most of its vines already eight years old, remained under contract to sell grapes to Vincor until 2009. Since Eva is the daughter of Burrowing Owl president Chris Wyse, one can assume there will one day by vineyard-designated wines. Burrowing Owl’s winemaker, Bertus Albertyn, is already keeping some Eva’s Vineyard wines separate long enough to assess his options both for blends and for single vineyard wines. A recent tasting at Burrowing Owl included a barrel tasting in the cellar of wines from specific blocks in both the estate vineyard and in Eva’s Vineyard. Some of the wines show the individuality that cries out for small lot production. 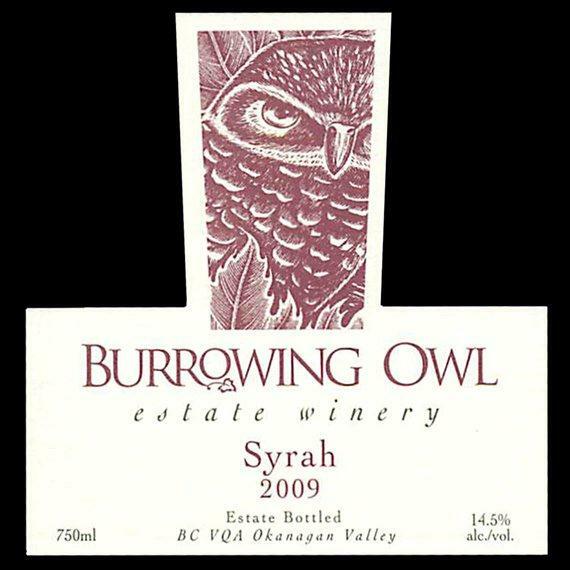 On the other hand, Burrowing Owl over the last 15 years has developed a following for consistent estate blends so good that most of the wines already are on allocation. When and if the winery starts releasing small lot wines, there may well be knife fights among restauranteurs to get what will be highly prized wines. Other wineries would like problems like that. Burrowing Owl is responding to demand for its wines with incremental production increases and with some additional wines. For example, the winery has a Fumé Blanc style of Sauvignon Blanc under development. Secondly, the winery a few years ago launched a second label, Calliope Wines. Since the initial release of just one wine, a Sauvignon Blanc, the value-priced Calliope portfolio has been expanded to six wines. There is a double barrel strategy here. Firstly, the lower prices of these wines attract to the Burrowing Owl orbit new consumers who might find most of Burrowing Owl’s portfolio a touch pricey. Secondly, because some of the wines are made with purchased grapes or with newly planted varietals, it gives the winery the chance to experiment. The winemaker gains experience with varieties not always grown at Burrowing Owl; and the winery’s sales team gets to test the market’s acceptance of new varietals and blends. Currently, Burrowing Owl has three vineyards. The 140-acre estate vineyard which surrounds the winery on the Black Sage bench supplies most of the winery’s fruit. Eva’s Vineyard is a 30-acre property with 11 acres of vines, all of them red varietals, although the winery plans to plant Viognier there as well. Smallest of the three is a 9.5-acre vineyard near Keremeos that grows mostly Sauvignon Blanc, with two tiny blocks of Sémillon and a test block of Tempranillo. These vineyards give Bertus enviable winemaking options. Here are my notes on current releases. It should be noted that Burrowing Owl sells through several channels. Some of the production is allocated to VQA and private wine stores as well as restaurants; some is allocated to internet sales; and some is available in the winery only. The Calliope wines are sold through VQA and private wine stores as well as from the separate web site. The prices quoted here are VQA prices. Some private stores set somewhat higher prices on the wines. 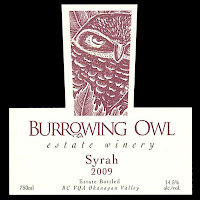 Burrowing Owl Pinot Gris 2011 ($20). The winery has recently expanded its Pinot Gris acreage somewhat to meet the demand for what many regard as a benchmark Okanagan Pinot Gris. This wine has the classic aromas and flavours of pear and citrus with a hint of spice. The full texture gives this wine a generous, lingering finish. 90. Burrowing Owl Chardonnay 2011 ($25). Chris Wyse proclaim: “We are proud Chardonnay oakers!” However, the oak is very subtle in this wine, with its lingering buttery flavours of tangerine and apple. The release of this vintage is imminent. 90. 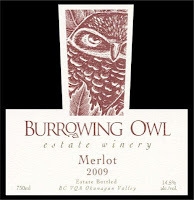 Burrowing Owl Pinot Noir 2010 ($30). From my recollection of previous Pinot Noir vintages, Burrowing Owl has progressively refined the viticulture with a variety that is tricky on sandy soils. The outcome has been wines with ever greater concentration. This deep, intensely-flavoured Pinot Noir is a good example, with rich and spicy cherry aromas and tastes. The tannins are well on the way to becoming silky. 89-90. 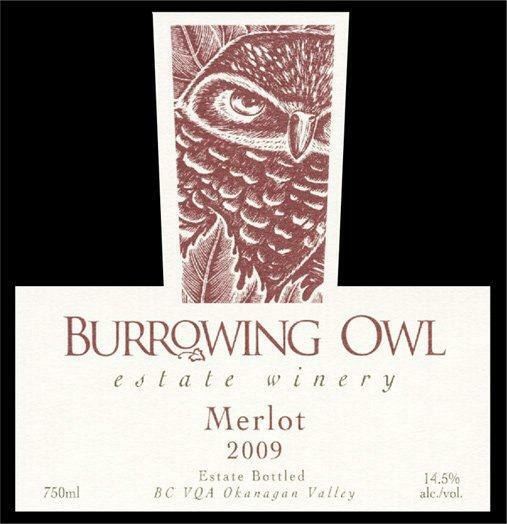 Burrowing Owl Merlot 2009 ($30). This is probably the varietal with which the winery built its reputation as one of the Okanagan’s leading Merlot producers. This wine is juicy on the palate, with concentrated flavours of plum and black currant and with spicy red fruit in the aroma and on the finish. 90. 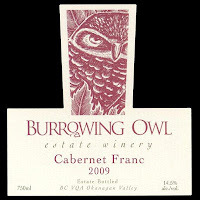 Burrowing Owl Cabernet Franc 2009 ($33). Here is another wonderfully concentrated red that begins with aromas of raspberries and blackberries. On the palate, there are brambly berry flavours along with hints of chocolate and spice. 91. 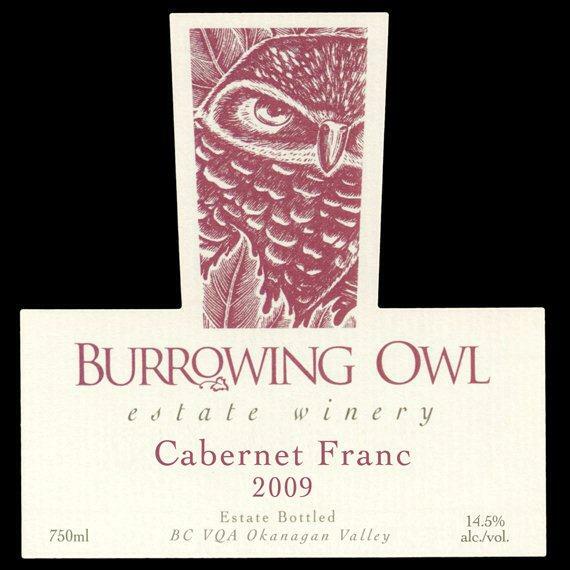 Burrowing Owl Cabernet Sauvignon 2009 ($38). This elegant wine is already delicious but it will deliver a spectacular reward to collectors who cellar it for the next seven to 10 years. Now, there is a core of sweet fruit – cassis, plum, cocoa and spice – all wrapped around long ripe tannins. 92. Burrowing Owl Meritage 2009 ($45 but sold out on line). Lucky the collectors who snapped up this complex wine. It is a blend of 38% Merlot, 33% Cabernet Sauvignon, 23% Cabernet Franc, 4% Malbec and 2% Petit Verdot. The intense berry aromas jump from the glass. On the palate, there are layers and layers of flavours, including cassis, black cherry, plum, coffee and cocoa. This will also age well. 93. Calliope Sauvignon Blanc 2011 ($16.99). 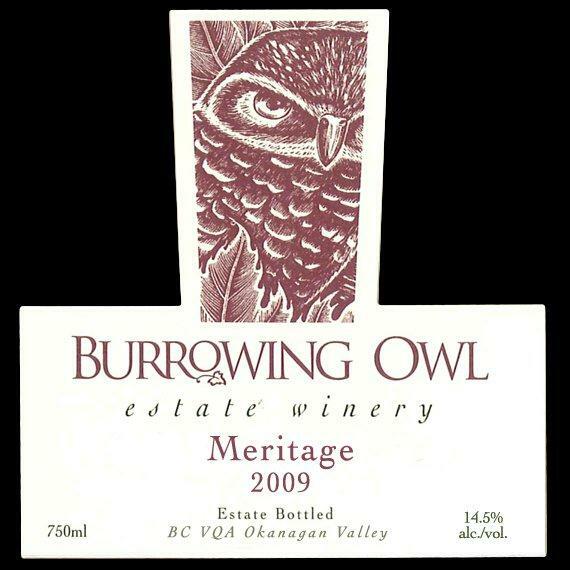 Burrowing Owl Estate Winery uses the Calliope label for appealingly-priced wines made, at least in part, with purchased grapes. This is a refreshing, tangy white with herbal and lime flavours and with a crisp finish. 88. Calliope Viognier 2011 ($15.99). This displays the classic weight and minerality of the variety, with aromas and flavours of pineapple and green apples. 88. Calliope Riesling 2011 ($14.90). This wine begins with delicately floral and herbal aromas. On the palate, there are citrus flavours, with a crisp and tangy finish. 88. Calliope Rosé 2011 ($13.99). A wine with a lovely rose petal hue, this is made with Syrah (70%) and Viognier (30%). The wine begins with aromas of strawberry and cherry and delivers of raspberry and wild strawberry. The finish is crisp and dry. 88. Calliope Figure Eight White 2011 ($21.99). This is a delicious blend of 30% Chardonnay, 40% Sauvignon Blanc, 25% Pinot Gris and 5% Viognier. It begins with herbal and citrus aromas and delivers citrus and melon flavours, with a finish that is crisp and fresh. 89. Calliope Figure Eight Red 2010 ($19.99). This red blend is 78% Syrah and 22% Merlot. This is a solid barbecue red, with aromas and flavours of black currants, plum, raspberry and chocolate. 88. Blue Grouse Estate Winery, one of the low-key winery gems near Duncan in British Columbia's Cowichan Valley, has changed owners. Retiring founder Hans Kiltz (who was born in 1938) and his wife, Evangeline, have sold the winery to globe-trotting wine and grappa enthusiasts Paul and Cristina Brunner, who are currently residents of Lima, Peru. The Brunners – he is a mining engineer – would like to expand production and business at Blue Grouse, which has been making between 1,500 and 2,200 cases annually, exclusively from its 10- acre vineyard. In addition to planning to plant more vines, the Brunners are canvassing other projects for the property’s attractive landscape. The vineyard takes up about a third of the property. There is more plantable land available on an excellent southwest slope bordered at the bottom by a bucolic creek. There is room beside the creek for accommodation for winery visitors. “We will look at the possibility of doing a farm-style inn,” Paul says. A German-born veterinarian, Hans acquired the property in 1989 and licensed the winery in 1992. The small vineyard already there when he bought the property had been planted by the late John Harper, a pioneer grape grower on Vancouver Island. The vineyard now grows primarily Bacchus, Ortega, Pinot Gris, Müller-Thurgau, Siegerrebe, Pinot Noir and Black Muscat. The latter variety is exclusive to Blue Grouse. Paul was born in Colorado in 1950, the son of a Swiss-born carpenter and developer. The Brunner family moved to Canada in the 1960s, first to Powell River and then to Nanaimo, soon taking out Canadian citizenship. After several years there, he went to the Harvard Business School for a master’s in business administration. He returned to work in the mine service field, fashioning a long career with an international drilling services company called Boart Longyear. He was the company’s chief executive in 2008 when he retired. The Boart Longyear career led them to live in numerous wine-producing countries, including Chile, South Africa, Australia and the United States. He became a collector of good wines, although every international move in his career disrupted the cellar. What is left of the cellar is currently in Lima, where he and his Peruvian-born wife, Cristina, have been living for four years. As his wine interest burgeoned, Paul began to look for an opportunity to buy a winery, perhaps in Argentina or in the United States. He began looking at Vancouver Island because he still has family on the west coast, including brothers in Yukon, in California and in Nanaimo. Blue Grouse has been on the market for about five years. It was originally listed about 2008 for about $4 million, just in time for the economic slowdown to deter possible buyers. The winery was listed again in the summer of 2010 for $2.75 million and this time generated some interest (although the exact sale price has not been disclosed). When his brother Steve from Nanaimo reported that Blue Grouse was an appealing property, Paul flew up from Lima. He was equally impressed and took some wine back to Lima for Cristina, who agreed they were good. The Brunners, who have just taken over Blue Grouse, have installed a veteran wine industry marketer, Corine Webster, as general manager, and have hired Bailey Williamson to manage the vineyard and make the wine. A 1996 culinary school graduate, Bailey came to embrace wine while working in various professional kitchens, including Sooke Harbour House. He moved to the Okanagan in 2001, taking Okanagan University College’s wine programs while working as a cellar hand at the Sumac Ridge, Jackson-Triggs and Township 7 wineries. From 2004 to 2006, he was assistant cider maker at Merridale Ciderworks on Vancouver Island. 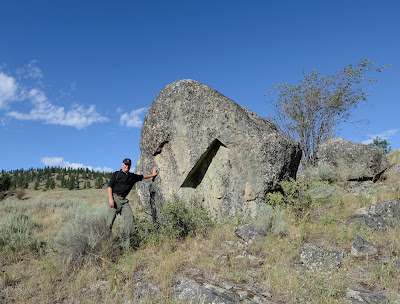 Then he returned to the Okanagan, where he was assistant winemaker at Road 13 Vineyard from 2006 to the end of 2011. 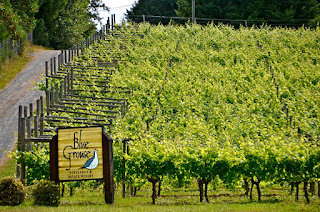 Blue Grouse has always produced exclusively estate-grown wines. Paul does not rule out bringing grapes from elsewhere but, if that happens, those wines would be released on a different label. “I think staying true to the island in terms of the Blue Grouse label is important to us,” Paul says, recognizing the integrity behind the Blue Grouse name. That is one of the reasons that the wines are so well known on Vancouver Island and can be found in most leading restaurants.